Extraction of wisdom teeth with just “infiltration”? 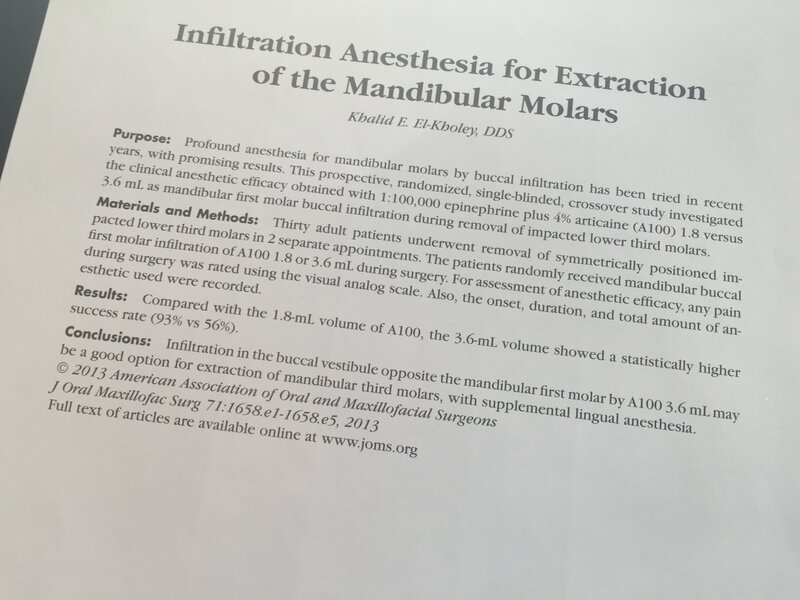 Recently at University of Pacific (UOP), one of my dental students brought up the topic of “infiltration” versus “nerve blocks” for the extraction of teeth – more specifically 3rd molars. Wondering why are we still providing IAN (Inferior Alveolar Nerve) nerve blocks in the lower jaw (mandible), when we have such powerful local anesthetics such as septocaine? 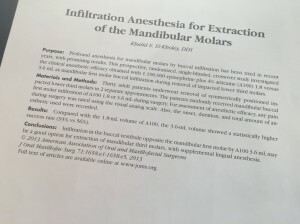 Well…there seems to more and more data coming our recently that is showing some promise for only using infiltration for the extraction of teeth, instead of nerve blocks. In a recent article in the Journal of Oral and Maxillofacial Surgery (JOMS 71:1658.e1-1658.e5, 2013) Dr. El-kholey has determined that if 2 carpules of 4% septocaine (4% articaine with 1:100000 epi) are used, the success in rate in achieving enough anesthesia was increased from 56% to 93%! And the remaining 7% that did not have adequate anesthesia only required supplemental lingual anesthesia. Amazing! So its not just the concentration of the local anesthesia at 4% that makes the difference but also the VOLUME (going from one carpule of 1.8ml to a total of 3.6ml). Will extracting my third molars help my other teeth?